What’s that, sport? It’s going to be you?! Alright, then. Show us what you’ve got. Hello, wanderer. We’re glad you decided to join us. You’ve got a lot to master before you venture out into the treacherous wastes. First, let’s learn a little bit about you! Would you say you’re more of a human type… or less so? No shame in that, friend. We understand the last couple centuries have been tough—so we’ve made space for those of the super mutant and ghoul variety (though don’t tell the Brotherhood of Steel we said that). You know, everyone out here has a little something special to bring to the table. Just ask our pal, the Brotherhood Outcast. That military-grade power armor of his is nothing to shake a stick at! But seriously, you won’t make dent. And that Wastelander over there? No, she’s not a mechanic, she’s just well-armed! Let’s not get ahead of ourselves, though. You’ll have plenty of time to learn about the rest, and there’s far more to a person than their limited, pre-game backstory! This player—our ghoul friend—has advanced quite a ways through the game. But don’t worry, kid. With time, you too can have a well-worn collection of wasteland goodies! The first card on the very left is his Character Card. That’s how we know he’s a ghoul, and a very ghouly one at that! He’s not the most solid guy you can be—you’ll see that his HP is limited to twelve—but his familiarity with radiation sure does help! See, at the bottom of his survivor board is a track, with Rads to the left and HP to the right. 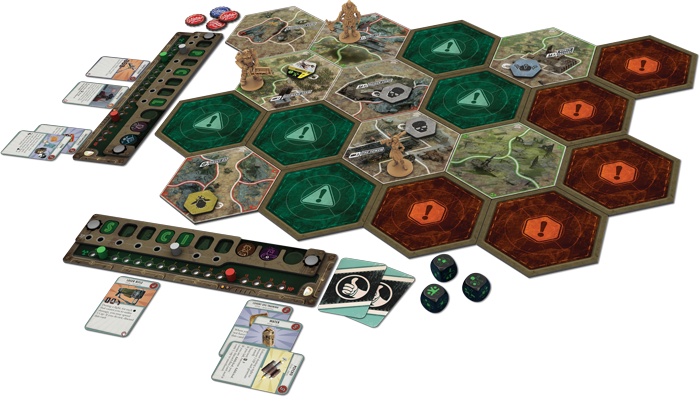 When traveling the wasteland, a survivor may gain Rads or lose HP, tracking them with the pegs on this board. Should the pegs ever occupy the same space or pass one another, the survivor will die and begin again at the starting space (maintaining their equipped possessions and XP). So while the ghoul is limited in health, taking radiation actually heals him. Neat, right? The next few cards below Ghouly’s board are his equipped items. With Combat Armor, an Alien Blaster, and Dogmeat at his side, I’d say things are looking up. And the fun doesn’t stop there, because Ghouly has a couple cards in his inventory and a few Caps to spare, too! 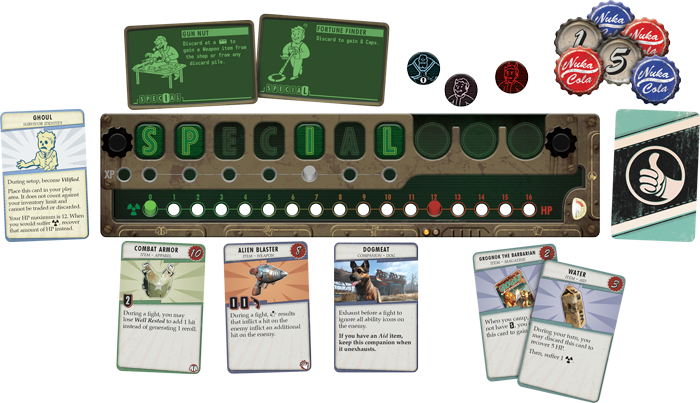 Continue around the board and you have influence cards (we’ll talk about those later), perk cards, and Ghouly’s S.P.E.C.I.A.L. tokens. As you can see, he is a Strong, Perceptive, Intelligent, and Lucky ghoul! I guess Endurance, Charisma, and Agility just weren’t in the cards. However, it looks like Ghouly has passed on collecting S.P.E.C.I.A.L. tokens once or twice in favor of the very powerful one-time use perks Gun Nut and Fortune Finder. They sure do look useful! Do you feel like yourself, yet? No? Good, that’s not the point. We’re going on an adventure here! Shaping the narrative of your character is but one piece of this wasteland wandering you’ve set out for. After all, what is a person without their many experiences? Well you’ll experience a darn lot, let me tell you! Between questing, killing, drifting, and chilling, you’ve got a busy schedule to attend to. When you set out to explore the world before you, you’ll have a few landmarks to guide your quest. These landmarks and the map surrounding them will depend on the scenario you and your fellow survivors choose to play. The four scenarios included in Fallout will be familiar to seasoned fans of the franchise, featuring The Capital Wasteland, The Pitt, The Commonwealth, and Far Harbor. Though the distinctive locations in each scenario are predetermined, the rest of the map will vary with every setup, allowing each survivor to suffer as many unique deaths as they please, game after game after game. Beyond the map itself, the scenario will also determine which two unique factions you’ll have the opportunity to behead or befriend—your choice. In The Commonwealth for example, the Railroad and the Synths go head to head (assuming you haven’t already done the beheading). On the back of the scenario card, you can mark the progress of these two factions, giving each side more power. Should one of the factions progress to the very end of the power track, the game will end, whether there is a winner or not. So don’t get ahead of yourself. Allies are only allies as long as you’re worth something to them. Finally, the scenario also sets up and drives the main quest you can follow in the game. 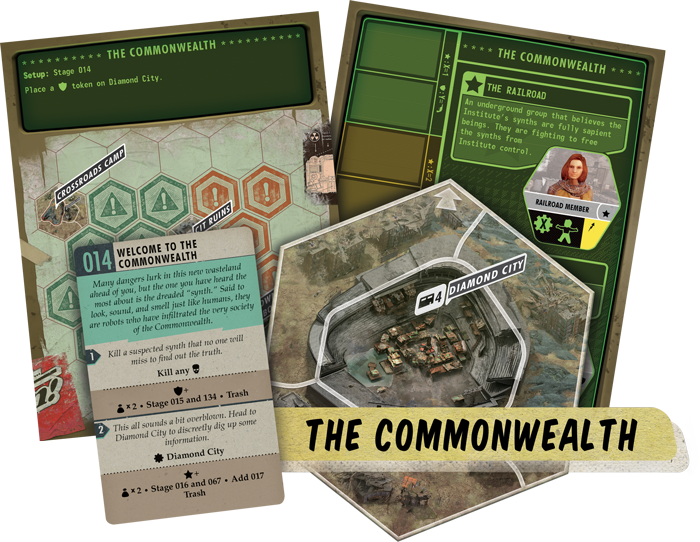 “Welcome to the Commonwealth” is the first card in the scenario depicted here, kicking off the main quest. Completing one of the actions on this card will cause the noted effects, move the story forward, and reveal even more quests. While the main quest cards will more often than not impact the factions, side quests will allow you and the other survivors to explore other stories within the game without pushing that primary narrative too far ahead. Now that we’ve sufficiently discouraged the senseless chaos we know you’ll all try at least once, let’s talk about how you—yes, YOU—can actually win the game. The Fallout franchise has long illustrated the idea that it’s not about the destination, but the journey, and winning this game is sure to take you on a wild adventure in kind. Remember that card turned facedown next to Ghouly’s board? Yes, the Influence one. That’s how you win! Influence cards can be collected as you wander the wasteland, earning you recognition for your unique contributions to the greater story. There are two primary types of Influence cards—faction-based and otherwise. Many of the influence cards will give you points based on the progress one of the factions has made. By revealing a “Security” or “Freedom” card, you will be able to align yourself with the associated faction, allowing you to move freely among members of that faction. Just think, you could make friends with the Brotherhood of Steel! Or The Institute! Or even a Slaver! There are other influence cards you can collect as well, which are not tied to the scenario’s factions, but instead to your own character’s inventory and acquired abilities. Whether the card offers extra influence for Caps, collected items, reputation, or something else, these cards will provide each player with unique objectives, affecting how they make choices in the game. That said, while you can develop teams through faction alignment, when you get down to it, everybody’s just looking out for themselves. Trust, sure, but a wise adventurer knows to be prepared to betray that trust at the draw of a card. There you have it! The delights of the wasteland are yours to enjoy. 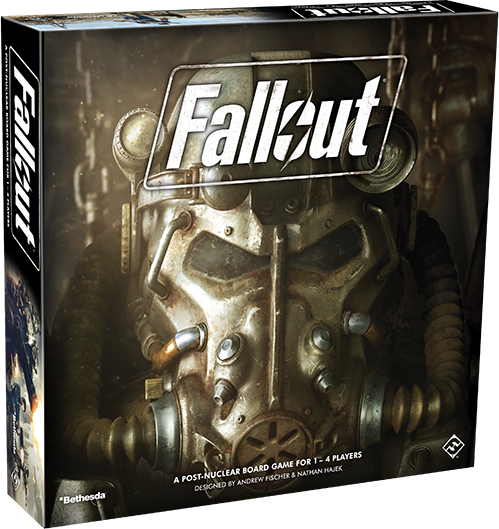 Whether you’re more of a Lone Wanderer or a Local Leader, Fallout will allow you to take on the run-down remains of the world in your own way, making choices, acquiring loot, battling bad guys, and leveling up your survivor. 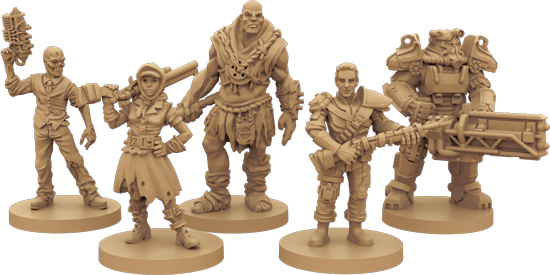 The wasteland experience of Fallout (ZX02) comes to your tabletop in Q4 of 2017!